We are given a rooted tree, where each node is assigned a unique number in the beginning (however after some operations on the tree, two nodes may have the same number). The weight of an edge is either 0 or 1 depending on whether the end points of the edge are assigned the same number. We need to support two kind of queries on this tree: The first kind of query takes a node x and assigns all the nodes in the path from root to x the same number y which was not present in the tree (y can take any value which is not present in the tree). The second kind of query takes a node x and returns the average distance from root to a node in the subtree rooted at x (the distance of a node from root is the sum of weights of the edges in the path from root to the node). average distance from x to a node in the subtree rooted at x. Hence, the second kind of query can be split into two separate queries computing (1) and (2). All the three queries (update query, and the above two queries) can be answered in O (lg N) time in a balanced tree as well as in a caterpillar tree using a combination of binary index tree and segment tree. Hence, an algorithm based on heavy-light decomposition can be used to handle the queries in a general tree in O (lg2 N) time. Let us denote the root of the tree by r. The weight of an edge between two nodes a and b is given by c(a, b). The distance between two nodes a and b is denoted by d(a, b) which is the sum of the weights of all edges in the path from a to b. For each node xi, the path from root to xi must pass through x. Hence, the computation of average can be done in two steps: In the first step we compute d(r, x), and in the second step we calculate the average distance between x and a node in the subtree rooted at x. Average Query (Sum Query): Calculate the average distance between x and a node in the subtree rooted at x. Since the update query does not affect the topology of the tree, for each node x we can precompute the size of the subtree rooted at x. This will reduce the third query to compute the sum of distances from node x to the nodes in its subtree. From now onwards, we will assume that the third query corresponds to computing sum of distances. Now let us see how many times an edge between nodes xi and xj (if exists) is considered in the above sum. The edge (xi, xj) will come in all the paths from x to xk, where xk lies in the subtree rooted at xj. here sz(b) denotes the number of nodes in the subtree rooted at b, and c(a, b) is the weight of the edge (a, b). In an abuse of notation, lets call the quantity sz(b) * c(a, b) as the generalized weight of edge (a, b). The above definition of S(x) is more useful as it allows to compute the S(x) of a node by using the S() of its children. Therefore the S() of all nodes can be computed using a single traversal of the nodes in reverse topological order. It can be seen that the update query changes the S(y) for only those y which lie on the path from root to x. In this section, we discuss an algorithm to answer the above queries in O (h) time, where h is the height of the tree, i.e., the length of the longest path from root to a node in the tree. Note that, for any x there can be at most one y such that c(x, y) = 0. Hence, I(x) is well defined. This is because in the update query only nodes along a path are assigned the same number, and each update query assigns a unique number. Since the two children of a node x cannot be the part of a single path from root to some node, both of them cannot have the same number as that of node x. Now, we will discuss how to handle the queries in O(h) time using the above information. We just need to follow the path from x to root using parent pointers, and for each node y in the way compute the sum of c(parent(y), y), which will give the distance. Since the maximum length of the path is h, this query can be handled in O (h) time. S (x) = T(x) - sz(x) * c(parent(x), x). This will take O(1) time. Assume that the path from x to root is chosen. For simplicity we update the metadata in two passes from x to root, although the same can be done in a single pass. In the first pass we remove the convert the weight of edges from 0 to 1, and update the values (e.g., T(), I()) caused by this, while in the second pass we convert the weight from 1 to 0, and values. // the weight of the edge (curr, y) should become 1. // in the second pass. // be converted to zero. This means that if we have a balanced tree where h = O (lg N), then we can support all operations in O (lg N) time. Next, we consider the highly unbalanced tree, caterpillar tree, where height is O (N), and show how to handle the queries in O (lg N) time, and later we will combine the two to give an algorithm for general trees. A caterpillar tree is a tree, which has a central path, and each node is within distance 1 from the central path. An example is shown below. Clearly, the height of a caterpillar tree could be O (N), hence the algorithm of previous section will not be efficient here. We use a variant of binary index tree to perform the three kind of queries in O (lg N) time in this tree. We use the following data structures to achieve the same. Only information (2) and (3) is non-trivial, and in fact both of them are the same. However, for general trees they will be different. ZeroWtEdges, vector of non-chain nodes in decreasing order of height, which have zero weight edge with their parents. Initially, this list will be empty. Note that we can combine some of the above information into a single segment tree, but for clarity we store them separately. A binary index tree takes an array and supports querying subarray sums and updating a single value in the array. The reference shows how this can be implemented. Since we are storing the T() values of non-chain nodes in the binary index tree NonChainT, we can easily update any of them, or computing the sum of T() value of non-chain nodes whose whose parents form a subchain of the central path. A segment tree takes an array, and along with the queries supported by binary index tree, it also supports setting all values in a subarray to be zero. We will show later how to support this extra kind of query. For the time being let us assume that we have a black box data structure which performs these queries in O (lg N) time. Now lets use see how to support the three kind of queries on the caterpillar tree using these data structures. 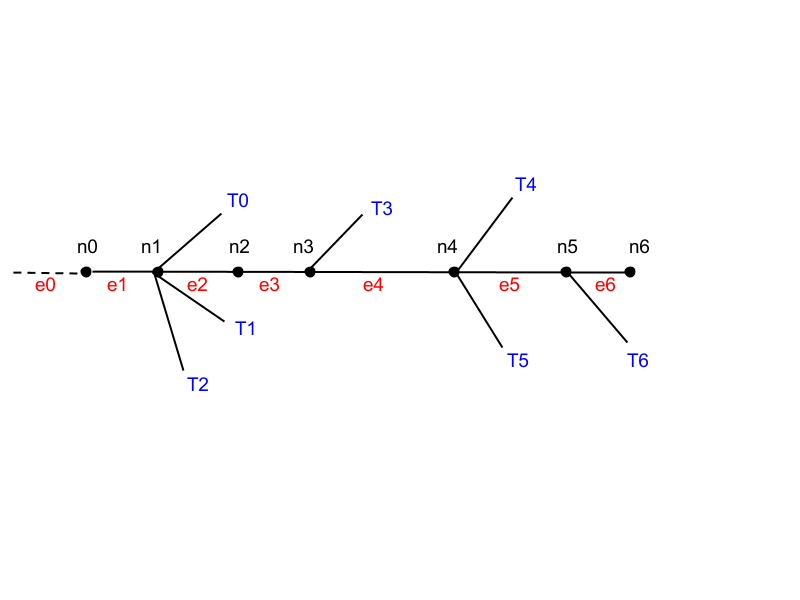 The first segment tree EdgeWeightTree, which stores the edge weights can be used to find the path weight of any subchain in O (lg N) time. If the chosen node x is a chain-node, then we need to return the path weight of the subchain [r, x]. Otherwise, let y be the parent of x, y must be a chain-node. We need to return the path weight of subchain [root, y] + c(y, x). Here tail is the last node of the chain. The first part of the sum can be computed using the binary index tree NonChainT, storing T() values of non-chain nodes, and the second part of the sum can be computed using the segment tree GeneralizedEdgeWeightTree storing generalized weights. Both will take O (lg N) time. Once again this can be done in two steps: first step will convert the edge weights from 0 to 1, and the second step will convert the edge weights from 1 to 0. If the chosen node is a non-chain node, then we move to its parent, which must be a chain node, and run the following snippet on it. On the other hand, if this node is a chain node, we directly run the following snippet on it. Let us say that x is the chosen chain node. // the weight the edge (z, y) is going to be changed to 1. Since the size of vector ZeroWtEdges can be O (N), a single query make take up to O (N lg N) time. However, the amortized time remains O (lg N). This is because each update query adds at most one element in the vector, hence after k queries there can be at most k elements. Hence, we can perform at most k pop operations on this list. If x is a non-chain node, then we have a new entry in the vector ZeroWtEdges corresponding to the edge (parent(x), x). Since after the first pass all elements of the vector have height greater than that of x, we can just push back x into the vector. Note that, we also need to update the T(x), and hence the entry in NonChainT. Next, we need to set the edge weights, and generalized edge weights of all links in the subchain [r, x] to zero, where x is the chain node closest to the one chosen in update query. This can be done by the special operation of our segment tree, which allows setting all values in a subarray to zero in O (lg N) time. A segment tree is a balanced binary tree where each node stores information about a subarray. If the subarray corresponding to a node x contains the subarray corresponding to a node y, then y must be a successor of x in the segment tree. In our case each node stores the sum of the corresponding subarray. In addition to the sum of the subarray, we also store a new boolean is_null at each node, which is true if all elements in the subarray are zero, and false otherwise. Using this variable we can update the segment tree lazily in case of a subarray nulling operation. // corresponds to a subarray whose all elements are zero. // to pass the null information to children. // debunking a null-zone as a non-zero value is being put in this subarray. // The whole subarray becomes zero. We have seen that if our tree is balanced, or is a caterpillar tree, then we can handle the three kind of queries in O (lg N) time. These approaches can be combined together in such a way that the queries on the general tree can be answered in O (lg2 N) time. This is achieved via heavy-light decomposition of the tree. The main idea in the heavy light decomposition is to partition the tree into disjoint chains such that the path from any node to root passes through at most O (lg N) chains. Since each chain can be visualized as a caterpillar tree, the problem then becomes equivalent of solving the problem on O (lg N) caterpillar tree resulting in O(lg2 N) complexity. Note that all the distance queries are on a single caterpillar tree, and all the edge weight queries are for the edges between root of a caterpillar tree and its parent. For the distance sum query, we need to consider only the chain where x lies, and use the same methods as that in the case of a caterpillar tree to compute the T(x), and then S(x) using the formula mentioned above. So now the questions is how do we partition the tree into chains such that no more than O (lg N) chains lie on any path from root to some node. The splitting into chains with such property is called heavy-light decomposition, and is described here. 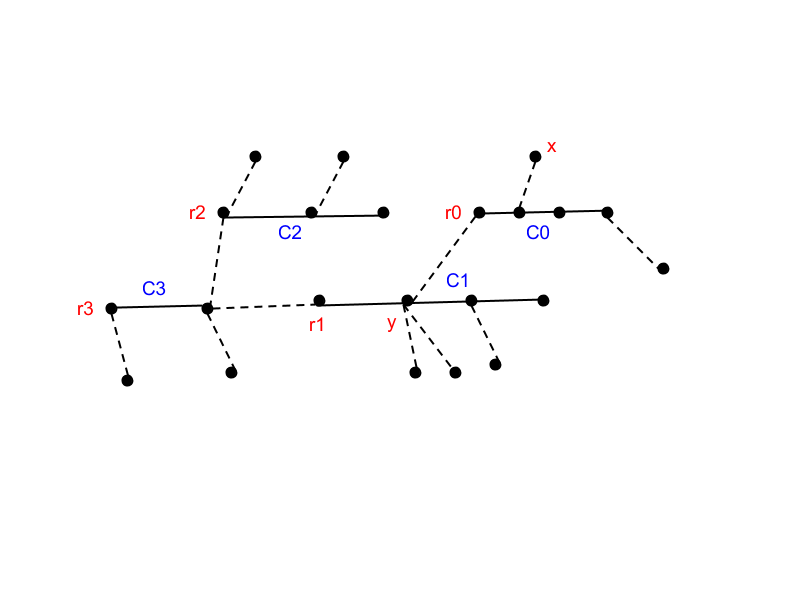 For a node x, if one of its children y has more than half of the nodes (i.e., sz(y) > 0.5 * sz(x)), then x and y are in the same chain, otherwise they belongs to different chains. Since there can be at most one such child of a node, the chain structure is well defined. Moreover, each non-chain edge (x, y) means the size of the subtree at x is more that twice the size of subtree at y. Hence in any path there can be at most O (lg N) non-chain edges, i.e., at most O (lg N) chains. As a side note, sometimes the query time on a caterpillar tree depends on the degree of the caterpillar tree as well (e.g., O (d + lg N), O(d * lg N) etc.). Most often, “binarizing” the tree as mentioned here helps reducing the time complexity to O (lg N) in such cases. However, in this problem such tricks were not required. In the above problem also support the query which takes a node x and returns the average distance between two nodes in the subtree rooted at x.
Author’s solution: admins, please upload. Tester’s solution: admins, please upload. I didn’t use Heavy-Light Decomposition for this problem. For this problem, I used a segment tree and lowest common ancestor (LCS) only. First, we see that the shape of the tree is not affected by any of the queries, so we precompute the size of the subtree rooted at each node, and reduce the q-query from avg to sum. Next, we consider an O-query, where a new gangster marches from a capital to a particular node. Now, as the new gangster traverses the path to the node, it is clear that some edges will be flipped from 0 to 1 or 1 to 0. Therefore, an O-query can be reduced to a sequence of queries of the following type (let’s call it an f-query): “For a given node, flip the edge from its parent to itself, updating all nodes in the subtree rooted at it (including itself)”. How do we know which edges to flip? First, we can see that the territory of each gangster will always remain a contiguous path from a node to one of its descendants, and the lowest node never changes. Therefore, for each gangster, we keep track its lowest and highest node, and for each node that is the highest or lowest node of some gangster, we keep track of the gangster number on that node. Let’s first define child(a,n) to be the child of a in the path from a to n (assuming a is an ancestor of n). L = u. This is the easiest, since there are no more changes that need to be done. u is an ancestor of L. Then we need to flip the edge from u to child(u,L). After that, there are no more changes that need to be done. u is a descendant of L. Then we need to flip the edge from L to child(L,u), and continue the query, now starting at child(L,u). u is neither an ancestor nor a descendant of L. Then, let a be the lowest common ancestor (LCS) of u and L. Then we need to flip two edges, the edge from a to child(a,L) and the edge from a to child(a,u). And then we need to continue the query, now starting at child(a,u). It is also necessary to update the lowest and highest nodes of each gangster we pass through. It is clear that we need to support three other subqueries, (1) given a node n and one of its ancestors a, determine child(a,n), (2) given two nodes a and b, determine LCS(a,b), and (3) given two nodes a and b, determine if b is an ancestor of a, a descendant, or neither. Both queries (1) and (2) can be done in O(log N) time by storing, for each node, its height and its **2i**th ancestor for every i ≥ 0. Query (3) can be reduced to (2) by checking if LCS(a,b) = b, LCS(a,b) = a, or neither. Therefore, we can determine which edges to flip in O(e log N) time, where e is the number of such edges. (q-query) For a given node u, find the sum of dist(capital, x) for every x in the subtree rooted at u. (f-query) For a given node u, flip the edge from its parent to itself, updating all nodes in the subtree rooted at u.
Let’s take a look at the f-query and see if we can simplify it a bit. First, we know that an edge can only have a weight of 0 or 1. Second, we know that all edges are initially 1, and the initial distance of every node from the capital is its height. If the edge from u to its parent is 0, set it to 1, and then add 1 to dist(capital, x) for every x in the subtree rooted at u. If the edge from u to its parent is 1, set it to 0, and then subtract 1 from dist(capital, x) for every x in the subtree rooted at u. These two operations, together with q-queries, can all be accomplished in O(log N) time by first doing a preorder traversal of a tree, and constructing a segment tree on the resulting traversal array. By doing a preorder traversal, we guarantee that each rooted subtree is in a contiguous subarray, and by doing lazy propagation, a segment tree can support update and sum queries in O(log N) time. (I found an amazing description here). The only problem remaining now is: How many f-queries will we perform? It is clear that a single O-query can potentially yield N-1 f-queries, and if one considers that there are Q = 100000 possible queries, it seems that there will be too many f-queries that we will need. However, let us determine how many f-queries we will need exactly. For a particular edge adjacent to the root, consider how many O-queries pass through it, and how many don’t. Let’s call the former x, and the latter Q-x. It is clear that we can maximize the number of f-queries on this edge by interleaving the O-queries that pass through it and those that don’t, giving 2·min(x,Q-x) f-queries. Assuming FN(1) = N, this recurrence can be solved as FN(Q) = O(N + Q log Q) (the choice that maximizes FN(Q) is always x = Q/2). O(N log N + Q log Q log N) time and O(N log N) space.